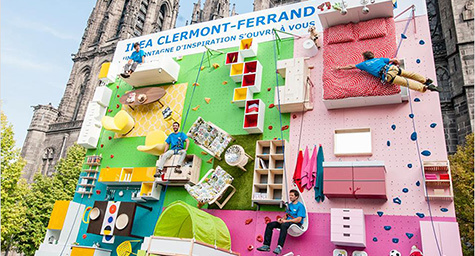 Ikea is literally showing its creative side by turning a fully furnished apartment sideways to serve as a vertical rock-climbing wall for a new billboard. The outstanding outdoor installation was created to celebrate the opening of the Swedish decor brand’s 30th store in France. By building the wall to resemble a well-appointed apartment that’s simply turned on its side, this stunning stunt is turning heads and turning the public into thrill-seeking climbers who navigate their way through the brand’s stylish offerings. AdWeek.com provided a peek at Ikea’s off-the-wall outdoor advertising concept. The billboard/rock-climbing wall is 9 meters high and 10 meters wide. It’s designed with safety-minded steps and grips to allow the passing public to scale the wall and make them themselves at home since the billboard was designed to look like a comfortable apartment. They can relax on the sofa, sit at the table, open the cabinets, and touch the accessories while they’re up in their harness and under the watchful eye of safety personnel. This is only the latest of Ikea’s many creative marketing efforts, which have ranged from promoting its traditional print catalog as the epitome of novelty, to lighting a forest with LED lamps to glorify energy-efficient light bulbs. Check out how Ikea has climbed to new creative heights. Discover the most innovative outdoor advertising strategies for success. Contact MDG Advertising. MDG Advertising is a full-service advertising agency and one of Florida’s top branding firms. With offices in Boca Raton and New York City, MDG’s core capabilities include branding, logo design, print advertising, digital marketing, mobile advertising, email marketing, media planning and buying, TV and radio, outdoor advertising, newspaper, video marketing, Web design and development, content marketing, social media marketing, and SEO. To discover the latest trends in advertising and branding, contact MDG Advertising.